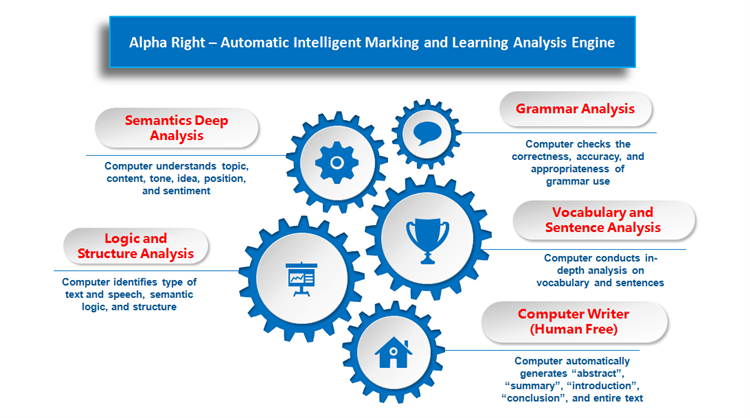 Alpha Right – the A.I Education technology engine of our wide range of education applications and also the solid foundation of our A.I. Education Cloud Platform – encapsulates a series of forefront and cross-field technologies including Intelligence Text Deep Analysis (ITDA), Natural Language Processing (NLP), Speech Recognition (SR), Semiotics Visual Analysis (SVA) and Expert Education Modeling (EEM) technologies. Alpha Right A.I. Engine can conduct a variety of analyses (as shown in following graph) that are most desired and valued not only in education sector but also in other industries such as legal services, government, E-business, and professional consulting services.